Ennedi plays Shosaloza is a Mayor Diary, authored by Ennedi. 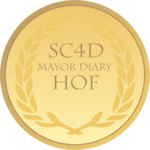 It started on August 25th, 2007, and was officially inducted into the Mayor Diary Hall of Fame on September 17th, 2008 and was one of the first three inductees (together with Whitefall, Iridar and Antigone. This page was last modified on 2 July 2009, at 06:15. This page has been accessed 5,423 times.